Here’s one that may or may not be familiar to classic adventure gamers. BioForge is a sci-fi quest that places you as an amnesiac character who wakes up in a futuristic prison cell. I know what you’re thinking, I can stop because you’ve heard this one before. Well, the catch this time is that you’ve been grafted with extensive and gruesome metal prosthetics from head to toe. Whoever you were, you’re clearly more machine now; a fact which allows you to escape your cell and investigate who you are, where you are, and why you’ve been decorated with more chrome than a 70’s muscle car. This search for answers is the driving force behind the entire game, and the reason you plod through the facility you’re held in, and fight all the monsters you fight. There is no sudden shift into an ending act where you have to save the world, or stop a villain – even though you will meet one ripe for stopping. You simply battle to find out your identity, and escape. This would be just fine, if the game actually maintained a focus on this mystery. Your new self; featuring regenerative capabilities, metal armor, and a burning desire to find Sarah Connor. The game has you asking a lot of questions in the beginning. Were you kidnapped? Did you volunteer? What is this facility for? However, it loses sight of nearly everything it takes the time to set up. My interest was piqued for the first hour or so, and this will probably be when most staunch adventurers will enjoy the game the most. You’ll be eagerly solving puzzles and perusing lengthy logs and journals for clues, and often I would read 17 pages into a journal, spot mention of a new character and get convinced that I had found the clue to my character. They did this successfully about four times. Unfortunately, these were short lived, lasting only as long as it took to hit Page Down and read that the mentioned character had died. Damn. Back to the search. This is one of the game’s central problems; you’re supposed to care about your identity, and you do, but it seems as if the game design itself doesn’t share or fully understand your curiosity. There are scraps to feed it, but rarely the focus that there should be. Most inexcusable of all is that in the end, the setup is not worth the payoff. As said before, the alleged point of the game is discovering your former identity. However, once you’re armed with this knowledge, nothing else happens. There’s no terrifying or mind bending reveal. Nothing within the game, or plot-related, changes. You simply read about the character that you were, and then go back to escaping. In fact, this knowledge is so detached from the crucial ending path, that you will likely miss it if you aren’t paying careful attention. Furthermore, you’ll learn this fact about five paces away from your escape craft. That’s how much it matters to this game, and it’s especially insulting after setting you up for some big discovery over the course of playing, and then casually tossing you a crumb. Even more insulting is that you don’t learn a great deal more about the rest of the game world. There are plenty of terminals scattered around with logs and journals that detail the events within the base. There are research reports that give vague ideas as to the purpose of the experiments at the facility. However, none of them are important to the game, and all of them simply act as vague, unfinished backstory. The logs you find will clue you in on the world outside of this facility, and the implications of what’s being done, and you do actually wish to learn more. The plot, specifically what happened to you and why, is engaging and rather unique. It’s a shame the game doesn’t follow through. Though some important questions do get their answers, ultimately, you get the feeling that BioForge isn’t playing all its cards – as if holding them for a sequel that never came. BioForge is split pretty evenly into exploration, puzzle solving, and combat. All three of these areas are actually strong points of the game. The facility you travel through is well-detailed, and contains numerous items for pickup or perusal. Nearly any monitor you come across will display some useful commands for corresponding equipment, or a log or other text file. Items range from logbooks, batteries, and environment suits, to combat items like laser pistols or another inmate’s severed arm. The objects distance themselves from the backgrounds well enough, but often, monitors are too hard to distinguish. There are no indicators that highlight useable objects, so you have to pay attention and spend a lot of time “fishing.” Additionally, though the game does allow you to freely move within the facility, it’s still a very linear quest. When I was looking to pick up this game, I read others praising the freedom of exploration throughout this game, but let’s be serious here. It’s freedom across five levels of a complex, with maybe three rooms per level. 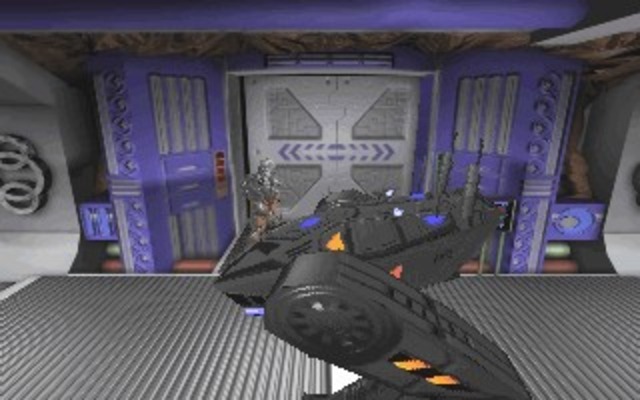 Origin was known for pushing computers to the limit with the games it published, and BioForge was no exception. 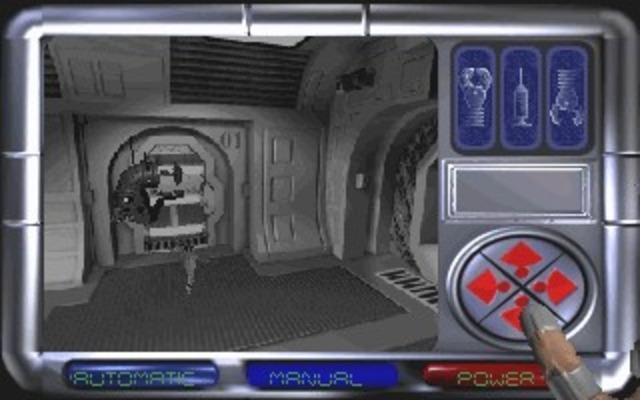 The game uses a combination of 2-D backgrounds and primitive 3-D models for all characters. They are made up of only a handful of polygons, similar to the look in Alone in the Dark, but the texture work here is much improved from that game. A typical problem with games like this is that polygon objects, as they are smaller than the characters, look too blurry or jaggy to make out even their basic shapes. BioForge seems to avoid this well, with few actual pickups and very distinctive shapes for them all. The game’s controls are questionable – awfully confusing at first, but gradually become more bearable. The third person perspective and fixed camera angles make lining up punches, or even the direction you want to walk in, overly frustrating until you get the hang of it. There are a number of hotkeys for various functions on your PDA, as well as for picking up and manipulating objects. Remembering them all, and their differences, can be a bit of a challenge. The keys for combat manage to be worse. It requires you to use the keypad section of the keyboard. When you put yourself in “combat mode,” your character assumes a fighting stance, and moves around based on the numpad. To fight, you have to hold down Alt or Ctrl and then press a numpad button corresponding to a certain attack. Generally, Ctrl controls punching while Alt toggles kicks, but often you’ll hit a dodge or strange attack that is unexpected and useless when you’re rushing to knock down a charging foe. After some practice, you’ll find one or two simple attacks that cause your enemies to stagger or get knocked down – stick with these and exploit them. The hefty delay between key press and actual point of contact all but rules out any kind of combo or strategic attack, and every attack makes it seem like your character is swinging a mace instead of his arm. Sounds aren’t terrible, but pretty scarce and repetitive. There’s only one noise for the laser, and considering how many enemies use the laser, that’s pretty damned annoying. Toward the beginning of the game, an alarm will wail endlessly, unless you luckily happen across the button to shut it off. Dialogue is mostly spoken, for both you and any other characters you encounter. The acting is decent enough, but your character’s delivery often wanes between properly confused to downright maniacal for no apparent reason. Also, during every fight, your character keeps spouting off lines along the lines of “I don’t want to fight you!,” while your enemy makes vaguely threatening retorts. This formula gets stale, fast. It also quickly degenerates into comedy as your character repeatedly yells “We should be working together!” as he delivers another brutal haymaker. It reminds me of the 17-minute fight in They Live between Roddy Piper and Keith David, and gets equally absurd. BioForge is a decent enough game, but one that can’t transcend what it’s lacking. It has interesting and logical puzzles, but far too few of them. It focuses on awkward combat more than most adventure games would, but even this is sparse, as the game itself is over all too soon. It shortchanges itself on its own plot; which starts out engaging, but melts away as if Origin lost confidence in it and decided to replace it with more combat challenges instead. If there actually was a sequel that this game keeps leading up to, BioForge would be far more recommended. In its current state, it plays like reading only a third of a book – interesting enough, but ultimately disappointing, as it goes nowhere. Great-looking sci-fi/horror tale. Plot starts out strong, with logical puzzles and interesting clues. Quickly collapses into a setup for a nonexistent sequel, making the plot, and by some extension, the game, feel incomplete.